Researchers in remote East Antarctica think a massive area of fractured ice discovered last month could be a newfound meteorite impact crater. The mile-wide crater (about 2 kilometers across) is a circular scar marked by fractured, rumpled ice — a striking blot in this otherwise smooth section of Antarctica's King Baudouin Ice Shelf. It was spotted by German scientist Christian Müller during an aerial survey by plane on Dec. 20, 2014. The possible impact crater is about twice the size of Arizona's Barringer Meteor Crater. Satellite images suggest the broken-up ice could be at least 25 years old. The crater was a serendipitous find, sighted by chance north of Belgium's Princess Elisabeth Research Station. German researchers at the station intended to remotely survey the surrounding bedrock, in order to gather new details on the Gondwana supercontinent's formation and breakup between 550 million and 180 million years ago. 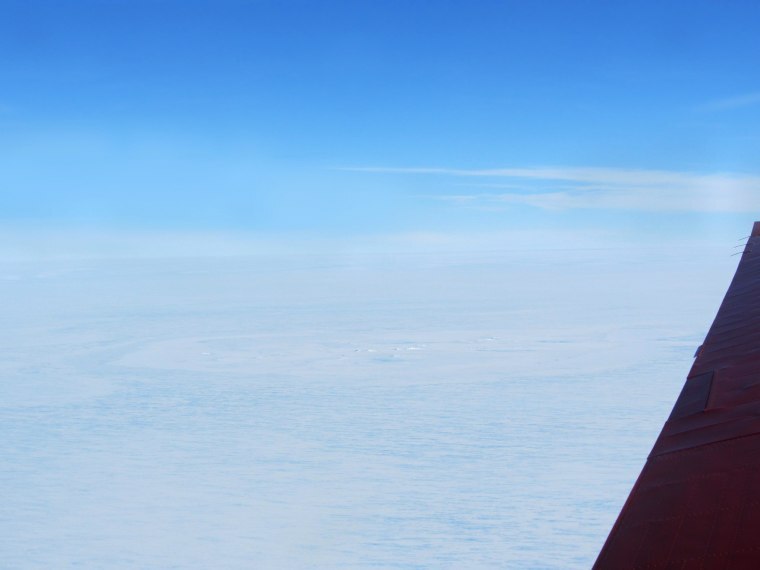 Flying over busted-up ice shelves — the floating extensions of the Antarctic Ice Sheet — was not part of the research plan. "We were only flying that far in the north because the radar equipment had broken, and we didn't want to waste a good flying day," said Graeme Eagles, a scientist at Germany's Alfred Wegener Institute who is currently leading the geophysical research survey. "It's been a tremendously exciting couple of weeks," he added. "It really is a very raw form of science, with a lot of people speculating on what might or might not be the cause." As a rule of thumb, an object that formed a crater is usually about 10 to 20 times smaller than the crater itself, said Peter Brown, director of the Center for Planetary Science and Exploration at the University of Western Ontario in Canada. That means a 1.2-mile (2 km) crater would result from an object that measures roughly 325 feet (100 meters) across, Brown said. "A very large explosion would have caused a 2-kilometer-wide crater — much larger than anything detected impacting Earth in recent history," Brown said. "So the feature seen is almost certainly not due to any meteorite impact." This is a condensed version of a report from Live Science. Read the full report. Follow Becky Oskin @beckyoskin. Follow Live Science @livescience, Facebook & Google+.